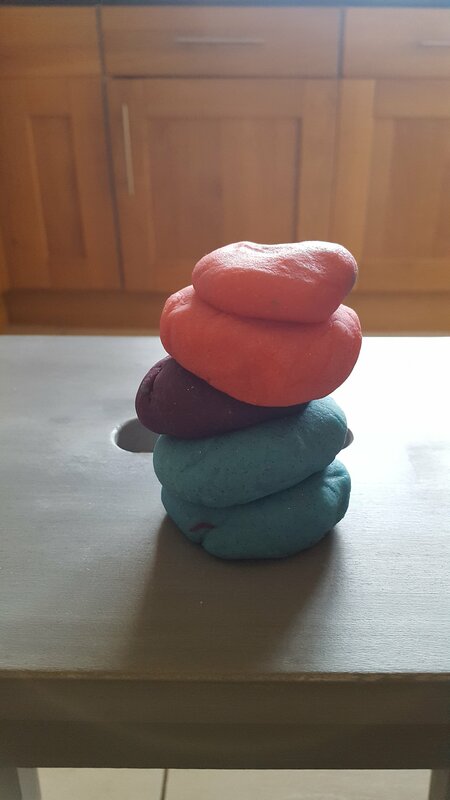 I’ve never made playdough before. I’ve managed to find it in Tesco for 25p and I thought it was too much of a faff. 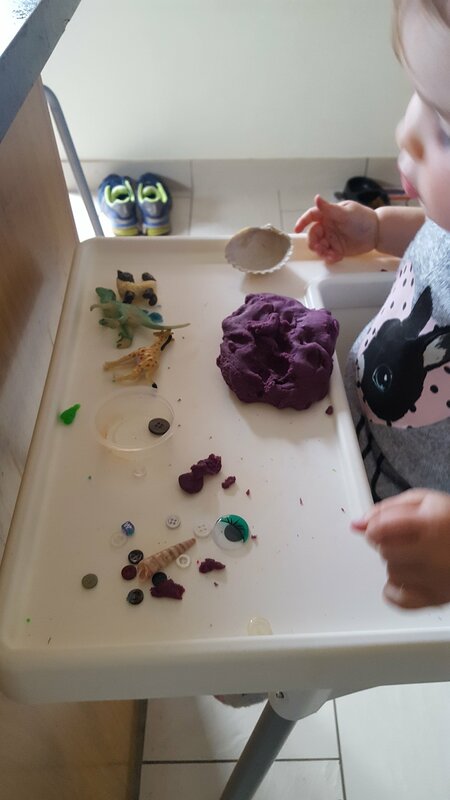 However, Tiny has recently been getting interested in playdough so when I saw a recipe at baby group today for “1 minute Playdough” I thought I’d give it a go. Put all the dry ingredients in a bowl and mix. Add the oil and then the water. Mix vigorously. Once it has cooled down remove from the bowl and knead until you’re happy with the texture. That’s it! No, really. Obviously no one wants boring old playdough though so I recommend jazzing it up with a few shakes of glitter, and some food colouring. This bit has the potential to get messy so wear gloves if you don’t want to stain your fingers and use a large chopping board or something similar to protect your work surface. I divided my massive lump of playdough into 3 smaller lumps and sprinkled some glitter on each (how much really depends on how jazzy you want them to be or how much you hate glitter). I then made a dimple in the centre and squeezed in some food colouring. Then you just knead them until you’re happy with the colour consistency or until you stop enjoying the warm, squishy playdough feeling (never). To make my playdough bedtime friendly I added a few drops of essential lavender oil. This might also work as a calm down tool or you could add different smells for a more sensory experience! It’s best stored in a plastic bag or sealed plastic container and lasts about a week. Next ›Making playdough even more fun!